Chile, of course, hosts some of the finest outdoor playgrounds on the planet; so it is without national affinity that I must apologise to Chileans for the hook being firmly implanted by the other Torres. Argentine Patagonia has captured my heart, perhaps due to the rain shadowed side of the Andes being a touch more amenable toward fun while the peaks churn beneath a cloud veil. Bouldering and the rapidly developing crags allow steep exercise while playing inevitable waiting game. Perhaps you well know the far southern reaches of the Americas protrude beyond any landmass in their stretch toward Antarctica; winds remain unhindered while lapping the globe accruing force before meeting the Southern Andes. Bad weather the unfortunate norm; why visit Patagonia? Perhaps because it is host to some the finest peaks, steep, aesthetic and unhindered by thin air: If life is truly a collection of moments then the brief vivid en route and summit views from here go straight to the bank. A child grazing paper with pencil depicting a Mountain may easily conjure a steep sided cartoon rendition of Cerro Torre or Central tower likeness? Above the rain shadowed plain, unique snow formations grace the tower’s summits, huge snow mushrooms resulting from cool air traversing the large ice-cap abruptly meeting warm Pampa air on the ridge-line created by Cerro Torre, Torre Egger and Cerro Standhardt. The frosting on the three towers isn't matched across valley, Fitzroy, Poincenot, Raphael, Exupery & De l' S offer dry routes without extensive mixed climbing. Strangely, for me the fickle elusive nature of the Torres' adds appeal; if the weather proves good, sneak up trying not to get noticed just in case the peaks become shy & quickly redraw their cloud shroud. Should an examination of psyche should be in order for finding the elusive attractive? Perhaps a product of years in Yosemite where rest between projects is simply that, never a down day due to inclement skies! Quite the opposite is Chalten’s case, weather is paramount in discussion topics, not dissimilar to Paine’s Torre or Japanese camp. Following the Banff Film Festival’s tour in Puerto Natales my opting to hop the border was immediately greeted by news of a monumental spell of impeccable weather! Not in the last few days but three weeks prior, did this mean the season had delivered and was closed for further steep desires? Climbers from all over the world simply hung out still revelling in their conquests. Relaxed and comfortable with accomplishments; free to boulder and indulge beyond the all encompassing desire to stand atop a spiky peak. Renan Ozturk, friend and fellow festival presenter accompanied me to El Chalten even though prior commitment allowed only two ‘sight seeing’ days his excitement was evident. My partner to fulfil a summit goal was Vicente Labate. He’d recently started teaching this frontier town’s children about the broader spread of our planet; probably a little of where all the gringos journey from, Geography his subject and the draw which made him reside there. Must admit a personal task-list of all the summit’s on the striking town skyline. Felt I was closing in on Fitzroy’s ridge/massif with only Raphael Juaruz remaining. A perfect first alpine journey for us; I’ve shared several cragging road trips across this nation with Vicente but never a peak in the place we met. Casting across the tyrolean from Bridwell camp feels to commence a step beyond civilization? Firstly into the woods; Lenga canopy initially shield wind but dropping onto the glacier spells a differing effect, not fierce gusts just a steady cold hum,… First up valley foray proved a gear stashing venture, rack, ropes & bivi kit wrapped and left optimistically. Round two came without much delay, a week later, on the weekend of course, food & clothing as only burden the glacier passed quickly; night without tent beneath El Mocho remained calm and still. The internet’s new role with climbing in Chalten shouldn’t be overlooked, since its reasonably recent delivery (via satellite) success rates may have been bolstered? We set out from Niponinos camp with security of a fine outlook for three days. Opting to go with the mornings flow had us hiking around nine am, neither of us being particularly fond of first light. We reasoned that our slender spire could be descended by headlamp if need be: Fine rational for a civilized time to start up a distinct rocky ramp leading into the Poincenot/Juarez gully. No crampon gamble paid off all the way to the col and commencement of the Piola/Anker route’s first pitches. Perfect timing as morning sun just peeped onto the north face in a warm inviting manor. Artificial climbing is noted on the topo yet our mindset was to free climb. Incidentally this line was picked due to popularity of the Anglo American & us not knowing if there were other parties with such intent, also due to friends reporting the Corallo a better line than route, due to scrappy rock. A short, steep corner with ice proved the eventful pitch, though I can’t speak for Vicente’s lead of an arching fist crack; his felt around 5.11a while my icy layback weighed in around 11c. We didn’t find need for the pendulum point noted on the topo. Simply, consistent, enjoyable climbing on impeccable rock with a few punctuation cruxes, not a single bad pitch, a classic. Initial five North side rope lengths course up a ramp and steepening corners before flipping onto the East face. Just tilted from the sun the following steep corner offered the crux, a brief icy thin hand crack that saw no slips from two over cautious candidates. 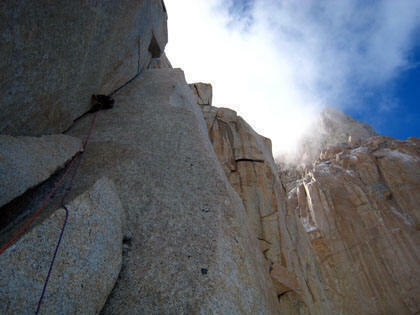 A pendulum swing was bypassed with a steep traverse into the continuous crack system thus delivering the summit - yet not before a memorable, less than fluid section of wide jamming tipping off-width occasionally. This steep, wide corner pitch followed the iced one and above those I can’t recall too much other than classic, enjoyable climbing: Ten on the topo which we stretched together into eight using a 60m rope. Excellent slides for the memory back, a fine journey with a good friend and plenty more project seeds planted for another southern summer. I’ve bitten deeply onto the hook of Patagonia, don’t think I could shake it free without a radical surgery at this point? I feel an arguable distinction of our societies rise to planetary control is the use of tools. They are essentially what separate us from beasts, a sign of civilization and perfect demonstration of how far we've come with opposable thumbs in gaining control of our environment. Tools forge this basis of Earth's hierarchy: A paramount aspect of our society that proved more than pivotal in getting us out of caves. Engines, computers, even as far as vessels to journey through and resist the vacuum of space, far & wide the implementation of ever developing tools have lead us. Evolution, progress: You'd think? Then why do we climbers strive to return to caves and all the while arguing the ethics of tool use? The question over tool use has now stepped into a whole new arena. 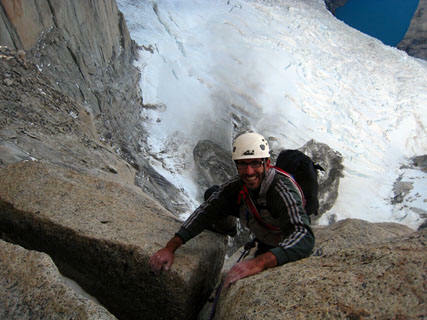 Recent fracas over Cerro Torre’s Compressor route has divided Argentine Patagonia; good friends sit in both camps and offer strong cases toward completely removing the bolts and leaving them untouched. I feel the most important notion in the argument isn’t really the Torre or the route in question but the step being made toward validating history. Surely if we begin to back track through time and evaluate everything that has lead to out current state of play won’t all development from fore runners be in question? Their successes and equally the mistakes have granted our basis? Do we have the right to remove history? Should we eradicate all that does not fit into an idealistic mould or should we simply leave examples of poor style to punctuate a point? Cerro Torre is probably the best example as many factors thickened the plot of his climb, Maestri was proving the Compressor for a company that had paid his way down to Argentina, their hope was to win a contract on the proposed Alaska pipeline and Maestri had sold them on his plan. In my opinion the Compressor could (and perhaps should) have been done in finer style with very few anchors but then again I wasn’t climbing in Maestri era and can’t really relate to a vertical world yet to be tamed by camming devices, sticky rubber and light weight gear. So what’s the deal with the Compressor route, not the controversy nor politics but the route, the climbing? My humble opinion would suggest it an absolute classic, one of the best alpine routes around and what a peak! Do the governing authorities understand what a bolt is? Many of course do, I’m just posing an example of how farcical our community’s debates must appear upon hitting the ears of those beyond our realm. Arguing claims toward legitimate land use won’t be treated seriously manor if we appear to segregated & split over issues that appear ridiculous externally? In North America authorities seem to view climbers as the lowest form of land users (strangely opposed to opinion around the world) and seem to have made up their mind without too much debate. We now hold the opportunity to prevent sentiment from rippling into fresh arenas where the land managers are a cleaner slate as per policies. Perhaps issues between climbers could change access? Case in point; a tourist strolls through a picturesque gorge, perhaps returning to a favourite place to share appreciation with the next generation. While re-firing childhood memories and granting the same to offspring, they pass by proud climbers just after the steep pioneers step back to admire glinting steel freshly installed into the cliff. The tourist immediately becomes horrified and steps up asking “what have you done”. Confused the climber responds, “What do you mean, this is my new route, those bolts went in from the ground up, no power drill”. The visitor is deeply offended that his sacred spot is now scarred, this tourist marches straight toward the land’s authority intent on lodging complaint. All the while the climbers stays on his heels explaining "Ground up" ethics without taking a breath until a ranger is found. Authorities quickly process the situation, acknowledging that nobody has any understanding of this ‘ground up’ stuff. They simply see steel. Rangers deem it too late to shoot everyone and head for early lunch; they simply see a bolt as a strange fixture that the climber states as ‘ground up’. Their concern doesn’t stretch beyond metal sticking out of their precious gorge and temporarily ban climbing until a solution can be sought! It wasn’t too distantly far back in climbing history that ‘hang dogging’ was considered a cardinal sin, even fought over!? Would that be explainable to friends who live firmly on the horizontal plane?